A Savings Account from FirstBank of Nebraska makes it easy for individuals and businesses to set aside funds for the future. Whether you are a disciplined saver or someone still searching for a savings approach that works well for you, contact us today. We'll assist with setting-up an account and help you identify a savings strategy that will work within your budget. FirstBank of Nebraska's First Savings Account will provide you with a secure foundation as you work to build your personal financial future. 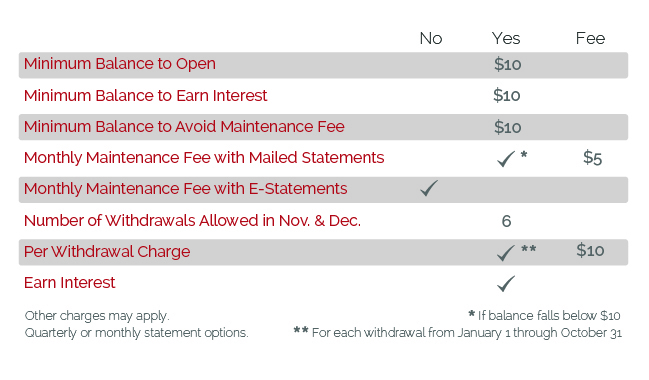 This interest bearing account can help you save for both holiday and year-end expenses. Ask us about setting up automatic deposits to your Holiday Savings Account and ensure that your funds will be available when the holiday season arrives! FirstBank of Nebraska understands the importance of have your funds available while keeping them safe and secure. That is why we offer savings options for businesses of all sizes.